Meet “Hummy”, one of the “charm” of Anna’s Hummingbirds that is lighting up our winter days. Charm is the recognized collective noun for hummingbirds, but the Cornell Lab of Ornithology suggests a few other terms: a bouquet, a glittering, a shimmer or a hover of hummers. All seem appropriate, as does the Lab’s description of Anna’s Hummingbirds as “flying jewelry”. The one in this photo, at the feeder on the north side of our house, is a female. A male often visits the south feeder – likely a youngster, since the red on his head is still a bit patchy. We’ve sometimes seen two hummers at a time at each of the feeders. But they move about very quickly, so trying to get an accurate census is like playing musical chairs at high speed – which is why we’re a bit vague about the exact number within this lovely little charm. We know there are enough to be keeping our two feeding stations busy this winter. This is only the second year that we’ve been graced with Anna’s Hummingbirds. Their range has been gradually extending northward over the past few decades and now they’re year-round residents in parts of our region. They seem remarkably calm compared to the Rufous Hummingbirds that are here each summer. Or perhaps it’s just that we’re not used to seeing hummingbirds in winter, before the raucous rites of courtship have begun. For the past couple of months a female has regularly perched in a bush of ocean spray (Holodiscus discolor), close to the north feeder. When we step outside we hear her short, sharp “chick-chick-chick” calls, and a second bird is often responding. We can join in and engage in what feels like an extended conversation, which is always fun. The females tolerate our presence well, and don’t hesitate to use the feeder even when we’re just a couple of feet away from them. They seem especially mellow when one of us is wearing a bright red raincoat. About the photo: while this is by no means my best-ever hummingbird image, I’m pleased with it all the same, especially as the odds were stacked against it working at all. I took it handheld with my 50-mm prime lens (not exactly a wildlife lens, but it’s what I had on the camera at the time), at a high ISO because it was late afternoon and the light was low. To make matters even worse, Hummy was backlit, so I needed to use flash – something I would never normally do with an animal, but this calm little bird didn’t seem to mind. 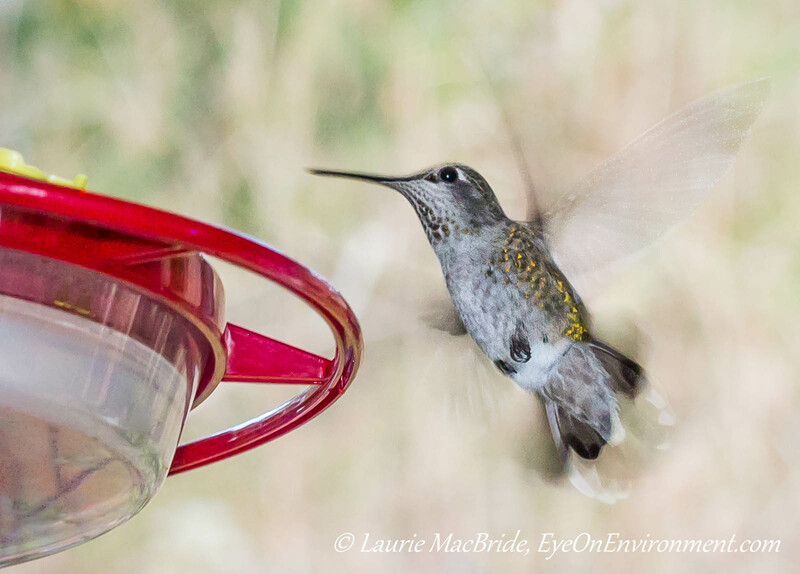 Posted by Laurie MacBride, Eye on Environment on February 6, 2014 in Animals & Wildlife, Birds and tagged animal behavior, feeding, flight, Gabriola, hummingbirds, nature, photos, red, winter. I had forgotten that was the collective noun for hummingbirds and yes, it is so appropriate. I’ve been wondering why the hummers are so noisy right now — now I know . Didn’t realize it was part of their mating ritual. Thanks for this comment & the one on my latest post, Diane. Kind of funny that right after I blogged about the crocuses, we received two days worth of snowfall. In all we had about a foot, and a lengthy power outage to boot – reminding me not to get ahead of myself about spring coming! That’s terrific you get to see these tiny jewels in winter. Although some hummers could potentially be here, we likely won’t see any until late Spring. We don’t usually see them until late March, when the first Rufous hummers arrive – so it’s very cool to have year-round hummers. Last year our Anna’s (just one bird then) disappeared when the Rufous arrived, but I’m thinking she probably didn’t go far away, as evidenced by our new population of Anna’s hummers! Thanks for the comment, Phil. Your posts are always a joy to read; thank you for your creativity, philosophy and just for being you! And thank you, Rosemary, for your very kind words! I’m really pleased to hear you like the posts. Laurie, your posts are always short, sweet, and interesting — a pleasure to read! This is a beautiful and “charm”ing image, Laurie. I love the composition and the beautiful background bokeh. I’ve never tried a shot like this myself so I’m in awe of your achievement. Thanks Sherry – as I said in the post, it was a shot unlikely to succeed – but sometimes you just have to try, right? What a blessing to see this little creature in the winter! Yes, it certainly is – they really lift our spirits. Thanks for the comment, Patti! Hopefully in a few years Anna’s Hummingbirds have taken up residence in your area too.